Ireland will soon have a law in place allowing for legal abortions, and according to Health Minister Simon Harris, that process will be cost-free for women. 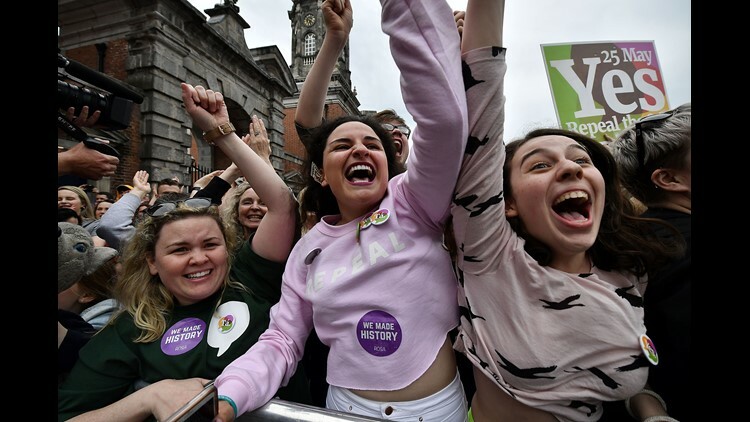 Yes voters celebrate as the result of the Irish referendum on the 8th amendment concerning the country's abortion laws is declared at Dublin Castle on May 26, 2018 in Dublin, Ireland. After voters repealed a decades-old abortion ban in May, Harris is tasked with drafting a new law to govern abortion, NPR reports. That law is expected to be submitted to the legislature next month and could be enacted by January, according to the publication. When asked on Wednesday how the law would handle the cost of the procedure, Harris told reporters his intention is for abortions to be free, the Irish Examiner reports. By keeping the procedure free through the Irish healthcare system, Harris said he hoped to prevent the start of private clinics and deter women from traveling outside Ireland to seek abortions, the Examiner said. In recent decades, thousands of women have traveled from Ireland to other parts of Europe for the procedure, NPR reports. Harris' comments came a day after Irish President Michael Higgins signed a bill removing the Eighth Amendment, which was added to Ireland's constitution in 1983. The amendment gave equal rights to a woman and an unborn child. In May, two-thirds of voters approved the referendum that repealed Eighth Amendment, bringing Ireland's abortion laws into harmony with the European Union and most of the rest of the world. Its neighbor, Northern Ireland, still has a near-total ban on the procedure. Contributing: Kim Hjelmgaard, USA TODAY.